The Endless follows Justin and Aaron, two brothers who escaped from a cult in the California wilderness called Camp Arcadia, ten years ago. Movies centered around a cult tend to focus on the leader or its active members by relying on the innate creepiness (of the organization). The Endless, by comparison, is dialed back, and focused on changing the dynamic to raise questions of doubt not only in its characters' minds, but in the viewers' as well. Having made a name for themselves in the low-budget thriller arena with Spring and Resolution (fans of the latter will recognize a few things), directors Justin Benson and Aaron Moorhead have taken their appreciation of all things Lovecraft to a new level worthy of recognition. Spending their days as glorified maids with bills piling up is not the life Justin or Aaron Smith imagined. For the elder brother Justin, anything is better than the commune he once publicly called a “UFO cult full of castrated members.” So it comes as a surprise when Aaron wants to go back for a visit after receiving a mysterious message. The familial bond between the two is evident from the start. Justin the Protector and Aaron the Bemused. Aaron doesn’t remember much of their time with the cult, but he’s never questioned Justin’s reasons for why they left. After the sudden death of their parents leaves them stranded, a younger brother looks to his older, wiser counterpart to be his father figure. It’s this sort of faith versus doubt battle that leads them back to the woods in search of answers they wouldn’t have understood earlier in life. Benson and Moorhead have chosen to take the path less traveled and create a story that bends the mind while answering one major question, but spouting off a hundred others. Back at the commune, the brothers reunite with those they left long ago. Aaron spends his time interacting with a few select members as they fill in the blanks in his memory. Seeing the camp through a lens opposite his brother, Aaron begins to wonder what’s so bad about Camp Arcadia. Everyone is friendly, healthy, and in a constant state of mindfulness. As the doubts rise, his connection with Justin ever so slowly begins to untwine. The unexplainable events that occur in the film are what drives the psychological terror. Pictures and videos appear out of thin air and mirror events that happened seconds before, while time loops catch people in never-ending sequences that always end in death before they’re brought back like a demented Groundhog Day. Clouds and flocks of birds spin in perfect circles for no apparent reason. A marked path with a transparent barrier hijacks and creates untrusting surroundings. 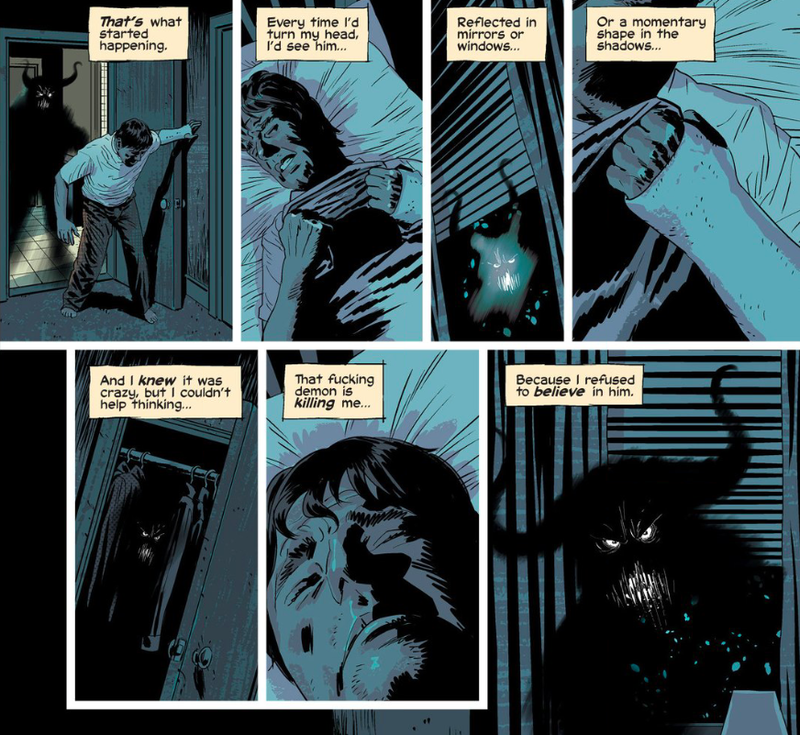 And then there’s the drawings and sightings of a dark, all-encompassing beast straight out of a Brubaker/Phillips comic. Simply known as “It” among those in the commune, there’s a two-sided relationship between It and the people in the woods. Those firmly entrenched in the unified movement of Camp Arcadia have awe and admiration for It, while others on the outskirts see It in the same vein of a tortuous child who discovered an ant hill. It’s not dissimilar to the stretched relationship between the two brothers. Benson and Moorhead leave questions unanswered simply because there is no explanation. There’s either denial or acceptance, each of which is magnified by Justin and Aaron. Justin has spent the past ten years driving home ideas he held to be true, but now that he’s come back after a decade absence he starts to wonder about how good his memory is. Aaron’s rose-tinted glasses lead him towards an internal connection with the group, specifically, a woman named Anna who remembers Aaron vividly. Perhaps the views held by Justin and Aaron portend a metaphor about positive or negative outlooks and how the same situation can create varying results. The story is captivating and offers its fair share of tense moments while simultaneously taking time to reflect. While the early exposition feels rushed, the meat of the film settles into place once the brothers arrive at Camp Arcadia. After reuniting with a few of the locals, the well-scripted conversations each brother has is a cause for meditation. This is the first film both Benson and Moorhead have stepped in front of the camera as leads. Justin’s perfunctory attitude abides well enough, though there is the occasional moment where it feels forced. Moorhead’s portrayal of Aaron is hopeful and solid throughout, and the contrasting viewpoints help make the brothers’ deteriorating relationship feel real. Aside from the last twenty or so minutes, this is not a fast-paced movie. The inital dryness between Benson and Moorhead is a bit off-putting, but becomes familiar as the film soldiers on. Normally this may be a drawback for a film about cults and unknown powers that be, but there is enough speculation and carrot stick dangling to stay invested. The earliest glimpse of something greater happens during an exercise called The Struggle, in which a rope is cast into a dark clearing for a one-on-one game of tug-o-war with It to represent one’s internal battle. One of the bigger carrots is an event called The Ascension, which bookends the entire film. It’s unfortunate that the film never fully delves into what purpose the Ascension serves, and instead brushes it aside with a wave of the hand from the leader of Camp Arcadia. This leaves the ending of the film with more head-scratching than perhaps was intended. It’s understandable that Benson and Moorhead want things to be more vague at the end of the film, but the lack of even a smidge of detail into the Ascension feels like a missed opportunity. This film is proof that Benson and Moorhead can excel with a very limited budget. However, that limited budget does rear its head from time to time. The editing can be a bit choppy at times, and while it’s not filmed Handycam style, there are moments of camera shaking that are noticeable throughout the film. These are nitpicking flaws to point out, and once the story itself takes over become less of a minor nuisance. Generally, we watch movies for the satisfying taste of resolution. The first act posits a question or goal. The second, an arrangement of pieces taking shape and defining the character(s) and their growth. The third brings the resolution and often a sense of relief when it’s all said and done. Benson and Moorhead hit that process on a micro level while leaving the viewer sitting through the credits trying to legitimize what just transpired.